5 Enlightened Ways To Use Google Trends for Keyword Research was originally published on BruceClay.com, home of expert search engine optimization tips. You need to select phrases worth targeting. Sure, search engines understand concepts that are semantically connected and don’t just match keywords anymore. But when you write a webpage or design an ad, you still need to know which words to use that will do the best job conveying your concepts to searchers. Many keyword tools lump variations together, like singulars and plurals. And they may ignore regional differences altogether. So you may be left in the dark, just guessing. Enter Google Trends. This surprisingly flexible and free tool can shed light on your keyword research. It gives relative search volume data — helping you choose between close alternatives, discover regional preferences and more. Here, I’ll show you five ways to use Google Trends to make enlightened SEO keyword choices. Your keyword research tool may not show differences in terms across a region or a country. Or it may look like the search volume is too low for you to worry about some keyword candidates. Sometimes that’s true, but sometimes it’s not. Looking these terms up in SEMrush provides keyword volume data and difficulty scores for the queries. You can also see a few alternative terms. However, there’s little or no information for these variations in a standard keyword tool. As a result, you might be tempted to just write about truck caps and camper shells, and leave it at that. Don’t stop there! If you enter all of the keyword suggestions you find into Google Trends, you’ll see a bigger picture. That’s because people in different regions search for different terms. You can look at the chart by subregion to see this clearly. So if your website targets the Pacific Northwest, you’ll want to include truck canopy. And in places like Montana and Illinois, you’ll want to talk about truck topper, too. These make sense for those markets. Which of those two images would you rather use to make a case for your keyword and content recommendations? You might wonder why the other keyword tools didn’t show any meaningful data for the alternative search terms. It’s likely because their data is based on nationwide searches. But we know it’s important to speak the language of our customers. So use Google Trends to help find keyword ideas for unique content by region. Language and search behavior change over time. How can you make sure your content reflects these changes? Case in point: We used to call ourselves an “digital marketing” company. Several years ago, Google Trends confirmed that “digital marketing” was declining as a search term. 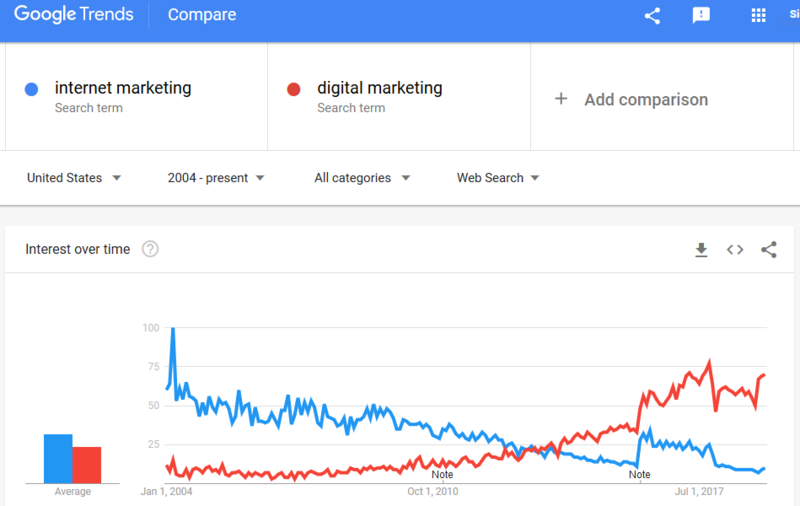 “Digital marketing” was rising. So we updated our site to reflect how people were searching for our services. By the way, “digital marketing” no longer fits our services as it’s become a very broad term. What we really do is provide great consulting services for “search marketing” (SEO, PPC, content, and social), but we do not do email or CRO or reputation management or PR and so on. So our keywords have evolved again. Sometimes trends swing quickly and permanently. 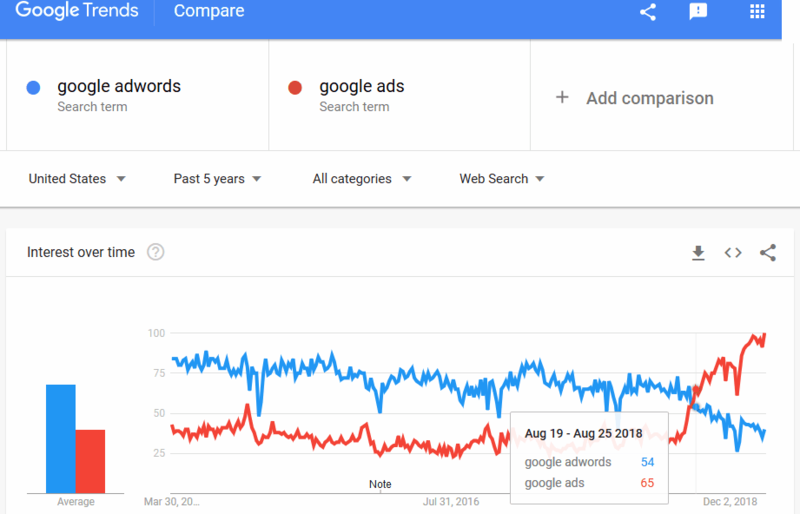 For instance, Google AdWords rebranded to Google Ads in July 2018. A month later, Google Ads had already overtaken Google AdWords in relative search volume – which the trend chart shows. Searchers change terms and adapt their searches faster than you (or your boss) might think. So plan to check Google Trends regularly. Watch for competing trends and update your content accordingly. Do you ever notice a big shift in your website analytics data and wonder what’s going on? There may be times when you don’t have enough historical data to know if your site is seeing an expected change in visits, or if something unusual has happened, maybe in the world at large. Look in your analytics and Google Search Console data for organic traffic to your landing page for a particular keyword. Also look in Search Console for organic search queries related to your term. Compare this to Google Trends for the same searches, and you can get a more detailed understanding of your site in comparison to larger search trends. Keyword search volume tools often lump results together. “Donut” and “doughnut” are listed as having the same search volume in SEMrush. Google Keyword Planner won’t even give volume results for the spelling “doughnut” – even though “doughnut” is the preferred spelling by the Associated Press (which guides most blog and newspaper writers). 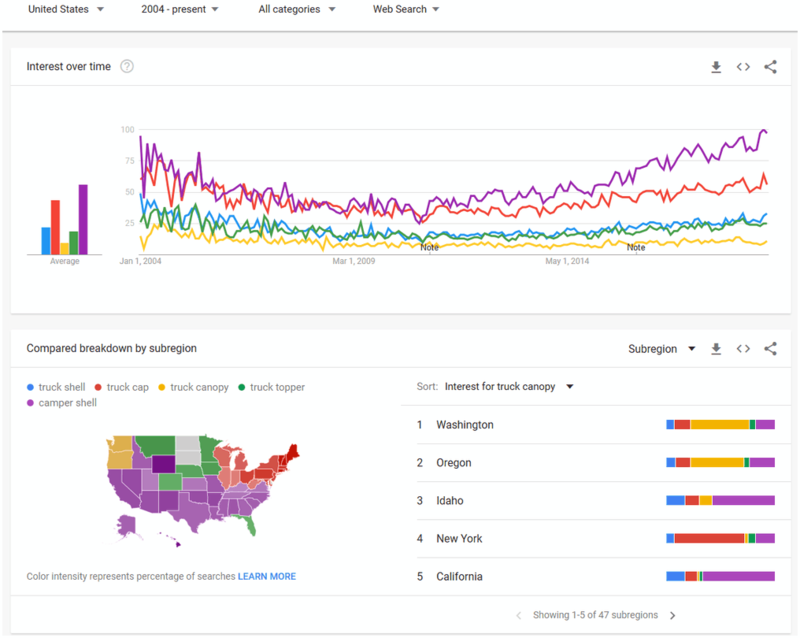 But using Google Trends, you can actually compare spellings to see how much search volume each variation gets. More importantly, notice the annual spike in search trends for all these donut-related terms? Scroll down to the Related queries section, and you can see searches related to National Donut Day in the U.S. (the first Friday in June). Aha! You have a new content idea for your site’s donut silo. Don’t forget daily and realtime search trends. Google Trends lets you change the length of time for your research to just the past day, past 4 hours, or even the past hour! When there’s an out-of-season spike in visits to your avocado recipes and your PPC budget for those related terms is spent by lunch, the trending searches can point out the avocado recall announcement and give you terms to add as negatives in your campaigns. Google Trends can get confused, however. 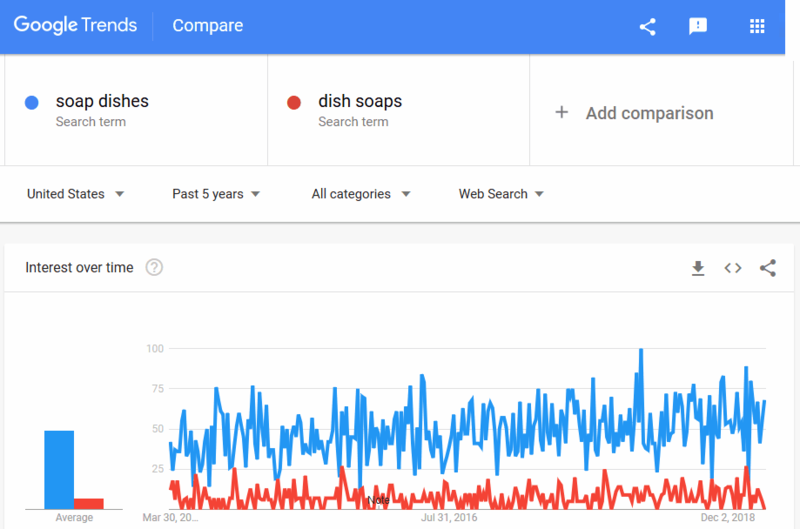 Searching for “dish soap” and “soap dish” shows identical search interest over time (you can’t even see the blue line below the red in the chart below). Yet they are two very different terms, and their results in a Google search are completely different. Another workaround for this Google Trends glitch is to use a plural for one or both search terms, when it makes sense. 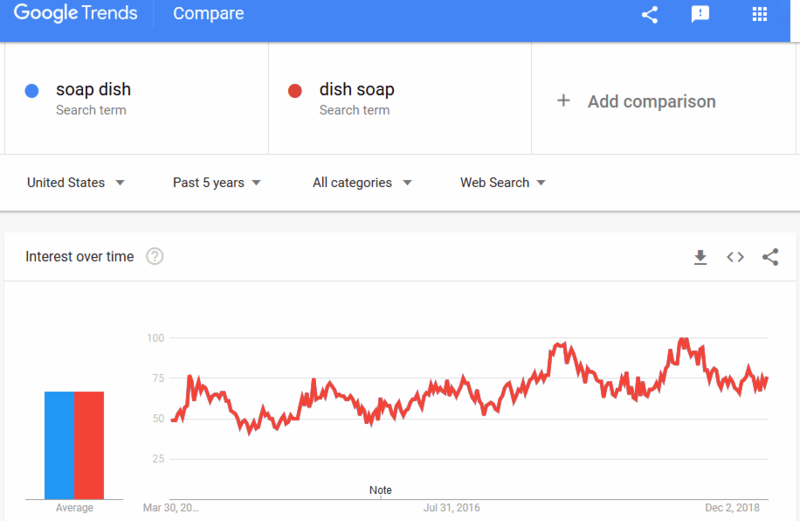 You can see that the trends for “dish soaps” and “soap dishes” are distinctly different. Similarly, “marketing technology” and “technology marketing” also show identical search volumes in Google Trends. When your common sense tells you that can’t be right, you’ll want to verify with another source. This could be as simple as performing a search in Google. Or you can look at comparison search volumes in another keyword research tool to see if searches really are identical. Remember, you are not your target market. You might be in your pickup with a truck cap and eating a donut, while your reader is driving around Seattle with a truck canopy and trying to find a doughnut. Use Google Trends to shed light on your keywords and help you know exactly what you should call things when. Like this article? Please share it with others who can benefit from these keyword research tips! Dieser Beitrag wurde unter Allgemein abgelegt am 29. März 2019 von Andreas. Advanced Search Operators for Bing and Google (Guide and Cheat Sheet) was originally published on BruceClay.com, home of expert search engine optimization tips. These tricks of the trade can definitely save you time, especially if you’re doing any kind of competitor analysis or SEO research. What Are Search Engine Operators? Search operators are a prefix or addition to a query in Google or Bing that limits the results set. They work like customizable filters. The results page you get back provides entirely different results than the average search. One common operation is to use quotation marks (“) to match an exact phrase. So searching for “advanced search tips” (with the quotes) finds only pages that have those words together as a phrase. Duplicate content is a problem for SEO. So use exact match searches to find any sites that have copied your content. Why Should I Use a Search Operator? Search marketing professionals routinely use search operators to filter results from a search engine. When you get comfortable with a few of these commands, you can find what you’re looking for much faster. How Do I Use Advanced Search Operators? You enter search operators in the search bar along with your regular query, but with some modifications. Be sure to type the operator next to your query text with no space. The site: prefix lets you find content within a certain website. 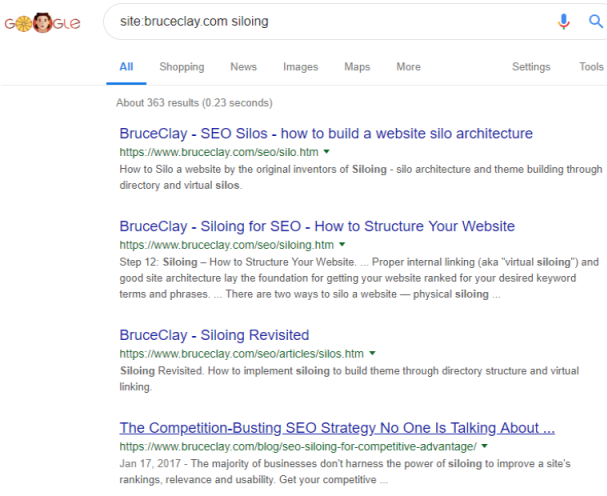 In this example, site: tells the search engine you want to browse a particular domain, bruceclay.com is the domain, and siloing is the topic you are interested in finding. The site: command filters your search results to just one website. This search found 157 pages. Without the quotation marks, the query would bring back way too many results. The engine would find pages about voice or search — so nearly all the pages on our site! cache: Shows the version of the webpage from Google’s cache. contains: Finds webpages that contain links to a particular type of file (such as pdf, mp3). This function is unique to Bing. ext: ext: Returns only webpages with the file extension you specify (such as htm). filetype: filetype: Finds results of a single type only (such as pdf). info: Presents some information that Bing has about a webpage such as related pages from the site, external pages talking about the webpage, and related results. intext: Shows pages that contain a specific word in their body text. intitle: intitle: Finds pages that include a specific word as part of the indexed title tag. allintitle: Finds pages that include all query words as part of the indexed title tag. inurl: Finds pages that include a specific keyword in their indexed URLs. allinurl: Finds a specific URL in the search engine’s index. Also can be used to find pages whose URLs contain all the specified words. related: related: Finds webpages that are similar to the specified webpage. site: site: Restricts the search to pages within a particular domain and all its subdomains. – – Excludes results that contain the word following the minus sign. Place this operation at the end of your search query. ” “ ” “ Finds instances of the exact text within the quotation marks everywhere it appears in the search engine’s index. Here I’ll share more ways to use the search commands for SEO research. In the example queries below, the searched phrase is in italics. The related: operator gives you a glimpse of competitor content. You’ll see a small selection of what Google considers to be similar. Then you can analyze their SEO metrics — including word count, keyword use, meta data and inbound links — so that you can make your page equal to and then better than its competition. This query brings up webpages that have both “SEO” and “blog” in their metadata title. We could use this in order to find competing blogs to our own. The search operators allintitle: and intitle: let you find pages using your keywords in title tags. The cache: command shows you a search engine’s cached version of a page. It’s a way to check how the search engine actually sees your page. Cache shows what page content the search engine considers relevant to retrieve, making this Google search operator a valuable SEO diagnostic tool. Using the info: command in Bing gives you results that seem like a collection of these advanced search operators. It’s a one-stop shop to access a variety of onsite and offsite results about a website. Note: Google deprecated the info: operator in 2017. A site: command shows how many pages the search engine has indexed. Though the total number of results is only an approximation, it is a quick way to find out if you have an indexing problem — either too few or too many pages in the index. Specify a particular subfolder of your site to see how many pages it contains. For instance, adding the wildcard * finds all pages under the /blog/. Along with doing SEO research, you can employ advanced search techniques to make site maintenance easier. The contains: Bing search operator gives you a powerful tool to find links within a site that point to a particular type of file. For example, the query above lets you locate every page on your site that has a link to a PDF file. A minus sign (-) before a keyword removes any results with that word. Again, it’s a way to help filter results when a query might otherwise be ambiguous. If you’re looking for info about cats the animal, but there’s a showing of Cats the musical in your town, you can search cats -musical to remove results about the theater production. You can use the minus sign (-) before a search command, too. The above example finds webpages that have your keyword in the title tag, excluding those on your own site. This reduces the clutter when doing competitor research. Did you like this advanced search operators guide? We’re full of tips for search marketing. (It’s what we do!) Learn more ways to improve your SEO, PPC and overall ROI by subscribing to our blog. Dieser Beitrag wurde unter Allgemein abgelegt am 12. März 2019 von Andreas. The One Thing Your Business Can Immediately Take Away from Google I/O was originally published on BruceClay.com, home of expert search engine optimization tips. Google leads the world in technological advances that affect the way we live and do business. 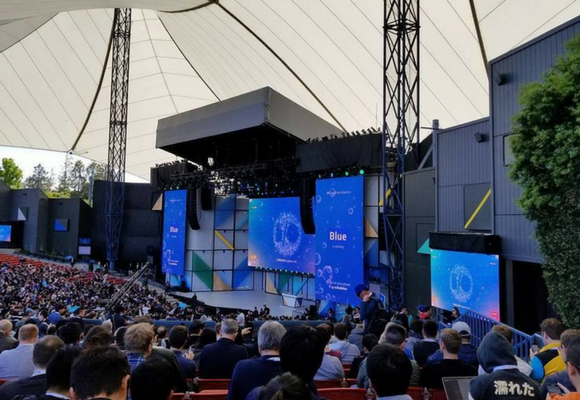 At the Google I/O developer conference this week, we glimpse a preview of how people will interact with computing in the near future. We have shifted from a mobile first to an AI first world. This shift into an “artificial intelligence first” world will impact the way customers find your business AND the way you interact with those customers. One thing becomes clear as you watch the tech giant unveil feature after feature: Each new product is designed to solve a problem. You could say this is the key to Google’s success. During yesterday’s keynote alone, Google announced many coming AI-enabled features that exemplify this problem-solution strategy. Here are just a few. Google Assistant will be much more connected, even allowing people to type their interactions through a phone instead of speaking them — because there are times you don’t want people to overhear what you’re saying. Google Photos is getting Photo Sharing, a new feature that can recognize people in your photo and proactively suggest sending them the file — because people have a problem following through and sharing their photos. Google Visual Positioning Service will be able to guide your indoor movements through a store such as Lowes to help you find what you want — which solves a big problem for visually impaired people, not to mention the rest of us who need help navigating aisles. Google Lens is a fascinating new AI feature that takes visual identification to new heights. In one application, Lens can remove obstructions in front of a subject, such as a chain link fence (see demo tweeted below), and fill in the missing elements — because people want to be able to take better pictures. What do people complain about in my industry? Complaints expose problems just waiting for a new product, service or technology to solve. This kind of negative feedback also provides clues for how to best engage your prospective customers. What is difficult or time-consuming for prospective customers to accomplish today? In addition to listening for pain points, also just observe. 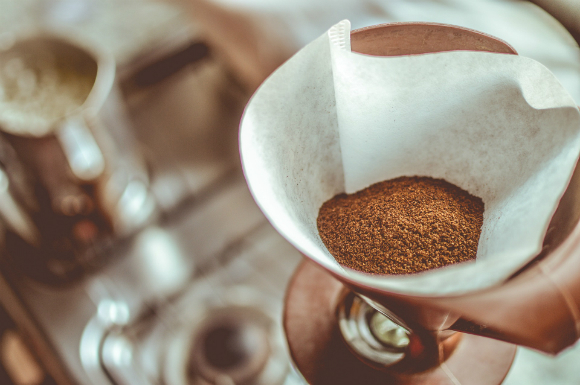 Look for processes that everyone just accepts, but which require a lot of time and effort to do. If your business innovates a solution to a problem, you can make people’s lives or jobs easier, potentially jump ahead of your competition, and grow your business. But even if you’re not going to invent the next great product, by understanding people’s needs better you can offer solutions more effectively. Your marketing campaigns will ring truer (and have better click-through rates!) if they come from a point of empathy. Solving people’s problems underlies the majority of Google’s advancements. Make it your business’s mantra, too. Note: You can watch Google I/O to see various presentations live May 17–19 (check out the schedule here). Dieser Beitrag wurde unter Allgemein abgelegt am 18. Mai 2017 von Andreas. Pinterest Pins sind jetzt in bing.com zu sehen. Das die bing.com Bildersuche jetzt auch in Pinterest sucht, macht die Plattform sehr attraktiv aus SEO Sicht. Immer wenn du die bing.com Suche benutzt wirst du auch Bilder von Pinterest sehen. Durch dieses Feature kann man unter Umständen noch mehr Traffic auf seine Webseite bekommen. Die Keyword suche die durch bing bei Pinterest macht dieses möglich. du erstellst dir ein Topflappen board auf Pinterest was mit Suchmaschinenoptimierten Keywords ausgestattet ist. Man sieht deiner wunderschönen Topflappen und die Suchenden klicken darauf und kommen „automatisch“ auf deine Webseite mit all diesen schönen Produkten die du herstellst. Und das alles nur, weil du ein paar kleine Suchmaschinen Optimierte Keywords verwendest. Dieser Beitrag wurde am 7. Oktober 2013 von Andreas in Allgemein veröffentlicht. Schlagworte: bing.com, Pins, Pinterest, Seo Tutorial, Traffic. Ist ein Verfahren von Google zur Bestimmung des Wertes ihrer Webseite.Die Einstufungen sind Werte von 0 – 10. Das ist jedoch der einzigste Wert den Google über eine Webseite bekannt gibt. Der Google Pagerank gibt keine Rückschlüsse über die Qualität oder den PageRank bzw über die Position in der Google Suche bzw in der Ergebnislisten von Google. Es ist nur ein Wert von vielen den Google nutzt um die Position / Rank der Webseite zu definieren. Dieser Beitrag wurde am 4. Oktober 2013 von Andreas in Allgemein veröffentlicht. Schlagworte: Analytics, google pagerank, pagerank check, Seo Tutorial.